The Norwegian government, which dramatically pared back a major wolf hunt in Norway this winter on the grounds it could be illegal, was all but ordered by a majority in Parliament on Tuesday to come up with a “broader” interpretation of the Norwegian law meant to ensure wildlife diversity. Finding a new legal loophole could allow the government to reverse its decision limiting the wolf hunt, and thus appease howling farmers and landowners who feel threatened by wolves. Syversen, whose party is one of the conservative minority coalition government’s two support parties in Parliament, had already realized that neither he nor other parties in Parliament could simply instruct Environment Minister Vidar Helgesen to allow a wolf hunt. Organizations and the few political parties keen to save wolves in Norway could simply challenge the hunt in court and probably obtain a restraining order. 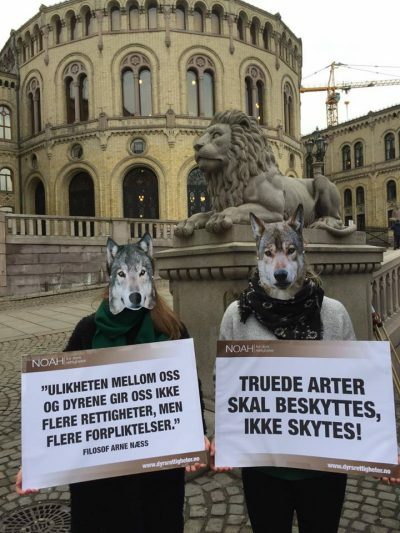 Since legal experts in the justice ministry have determined that shooting more wolves would violate both Norwegian law and international conventions to which Norway must adhere, the courts would probably support Helgesen’s position that a bigger hunt is illegal. So now the hunt is on for a new legal justification or loophole. Helgesen and the government have been under enormous pressure from the anti-wolf lobby that consists mostly of farmers who fear wolves will attack their free-grazing livestock, landowners who profit from hunting rights and fear wolves scare away wild game, and rural residents who don’t want wolves in their backyards. They’re backed by the increasingly populist Center Party, which has turned the debate into one pitting country against city, and rural residents versus a so-called political and urban elite. The anti-wolf lobby thought that last summer’s political compromise would result in a hunt that would kill off 47 of Norway’s roughly 60 wolves. Instead, Helgesen surprised everyone by granting an appeal from environmental organizations to block the hunt, based on the justice ministry’s legal interpretation that the government lacked evidence of the damage wolves could do, or the danger they really posed. He also pointed to international conventions that obligate Norway and other countries to accept predators as part of the nature. That set off loud protests and demonstrations mounted by people bussed into Oslo from outlying districts. Another protest and torchlit parade was held on Monday, just after pro-wolf activists had also demonstrated in front of Parliament. Helgesen, meanwhile, beefed up efforts to track Norway’s wolf population in an effort to collect documentation of their behaviour and threat potential. On Monday, he also proposed extending the hunt for wolves in designated wolf zones, from February 15 until March 31. If new documentation confirms a clear and present danger from the wolves, he would be able to justify shooting more of them. 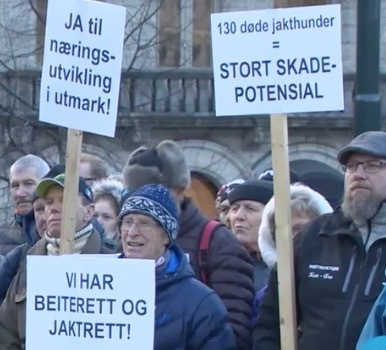 Helgesen was also in Parliament Tuesday morning, responding to demands that he explain in more detail how his ministry is managing Norway’s wolf population. He was harshly criticized by politicians from the Center Party and others but also hailed by the Liberal Party for having respected and carried out the law. Environmental and animal rights organizations, who also had applauded Helgesen’s initial restrictions on the hunt, were likely to fight any move to pick it up again.